At Bazaar Velvet, we have the privilege to work with some of the best interior designers in the country, helping them to create stunning rooms for their distinguished clients. But there comes a time when the interior designers themselves feel the desire to transform their own home, making it just as beautiful as the many projects they undertake day to day. When this opportunity arose for renowned interior designer Caz Myers, she used her many years’ experience to create herself a calming sanctuary that expresses her unique design flair. Caz was keen to take inspiration from the architecture and traditional Victorian features of her London Townhouse. She wanted the space to have a vintage flavour, and she did this thoughtfully by adding just a few vintage elements. These were tasteful and restrained to not dilute the elegance of the room, but rather to enhance it and injecting it with character. For those with a passion for design, it is of no surprise that this living room has been handled by an expert. However, an artistic eye is not the only skill needed for successful spatial design. Product sourcing plays a large role in the job of an interior designer, and this something Caz is clearly also very accomplished at. The distressed artwork on her wall is in fact a vintage door from a grand building in India. This is an extremely unusual and imaginative choice, but you could hardly argue with its effectiveness in the room. When it came to finding an equally wonderful rug, she thought there was no better place to search than Bazaar Velvet. Caz was of course a very discerning client, but it was clear to us all that our stunning vintage patchwork rugs would be the perfect choice. In some ways, they form a parallel with her artwork, an antique product being repurposed in way that is both useful and attractive to the style conscious homeowner. Dozens of different Anatolian vintage rugs are featured in each patchwork, giving an endless variety of pattern and colour. They have a wealth of texture too, a result of the ‘distressing’ process that takes place once the rugs have been bleached and re-dyed. This means that every product is unique. Caz Myers’ rug was made to order, with patches carefully selected to combine fabulously with her existing colour palette. 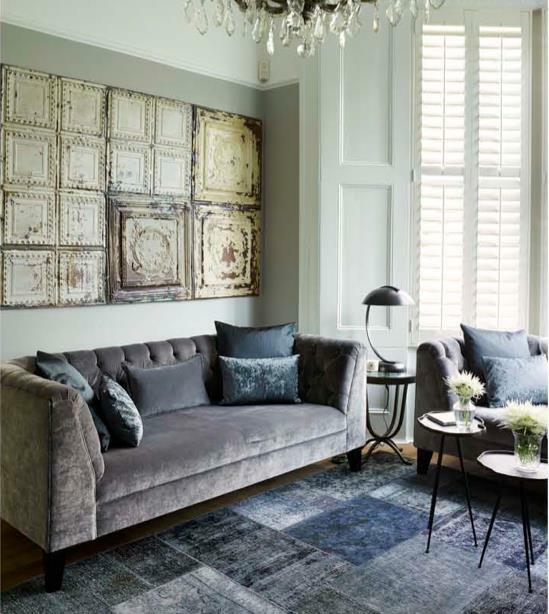 The faded indigos and denim blues provide an ideal level of formality and a calming base for the room. This interior is more than just a visually stunning space but a treasure trove of interesting items with a charming history. And how wonderful it must be for this accomplished designer to be able to spend time appreciating the stunning interior she has created.